"We are excited to offer this integrated solution to our customers who are investing in technology to address the active shooter threat," said Christian Connors, chief executive officer of Shooter Detection Systems. "By combining our indoor gunshot detection system with a robust video management system like victor, customers gain immediate, automated insights the second a shot is fired, providing exceptional situational awareness when every second counts." Active shooter incidents have been recognized by the nation's top 500 enterprise security executives surveyed as a top security threat facing their enterprise. Based on military gunshot detection technology and SAFETY Act Certified by the Department of Homeland Security, the Guardian Indoor Active Shooter Detection System combines an acoustic gunshot identification software with infrared gunfire flash detection to quickly identify gunshot incidents. 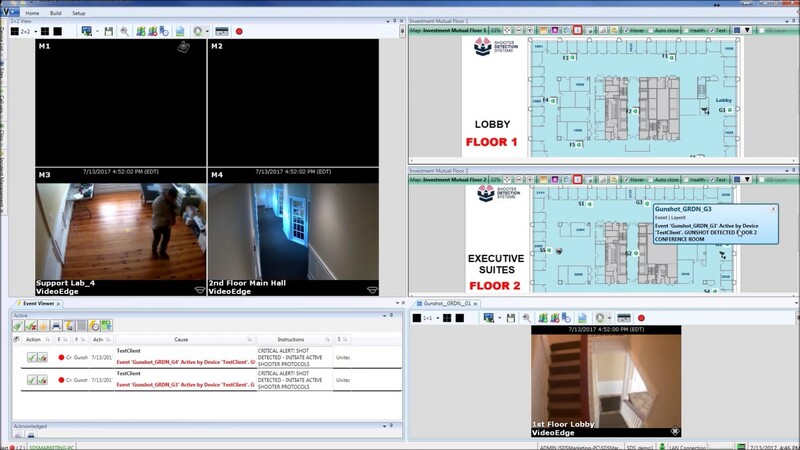 When combined with the powerful victor video management software monitoring features, the system provides the ability for instant shot location information, lock down procedures, live and recorded video from cameras in the incident related areas. The integration provides immediate notification to first responders through victor's event action and integration notification platform, and simultaneously alerts designated monitoring facilities around the globe. These capabilities are also available through the integration of Guardian Indoor Active Shooter Detection System and the C•CURE 9000 security and event management system from Software House. "This integration fully aligns with our vision to add mission critical solutions to our portfolio of integrations through our Connected Partner Program, where third-party technology partners have the opportunity to integrate into our security solutions," said Kristy Dunchak, director, Building Technologies & Solutions, Johnson Controls. For more information on the Tyco Security Products Connected Partner Program, visit connectedpartnerprogram.partnerproducts.com. For more information about Tyco Security Products, visit www.tycosecurityproducts.com. Johnson Controls is a global diversified technology and multi industrial leader serving a wide range of customers in more than 150 countries. Our 120,000 employees create intelligent buildings, efficient energy solutions, integrated infrastructure and next generation transportation systems that work seamlessly together to deliver on the promise of smart cities and communities. Our commitment to sustainability dates back to our roots in 1885, with the invention of the first electric room thermostat. We are committed to helping our customers win and creating greater value for all of our stakeholders through strategic focus on our buildings and energy growth platforms. For additional information, please visit http://www.johnsoncontrols.com/ or follow us @johnsoncontrols on Twitter.